When you’re normal-sized, no one cares what you eat; when you’re fat, it’s everybody’s business. Rosemary Goode is fifteen, five-foot six inches, and almost 200 lbs. Food is her comfort and she eats lots of it, especially the chocolate variety. Exercise is a dirty word to her vocabulary. At school, people bully her. At home, her mother and aunt are as bad as her peers, if not worse in some ways. Rosemary wishes she could lose weight for her health and for looks, but when food is her only friend, she doesn’t know how. So many of us have struggled with our weight and can understand Rosemary’s struggle. While my personal struggle has been due to infections and medication rather than junk food and overeating, I could still relate to Rosemary and the things she goes through. I understand her fear of mirrors. I can relate to feeling like no one could ever like me or find me attractive. I know what it feels like to have people looking at me when I’m eating as if I don’t deserve to eat because of my weight. Being fat can be embarrassing and demoralizing, especially if people feel the need to point it out to you or give you advice on how to become thinner. Our culture is so focused on looks, especially with regards to women. Models are starved to ridiculous weights and then airbrushed even smaller in magazines. TV feeds us a standard of beauty that looks like a cross between “third world dying of hunger” and “pre-pubescent girl.” Standing in line at the grocery store, we can see a whole myriad of magazines that tell us how to look thinner, firmer, younger, better. There is no attempt to help us to feel better about ourselves the way we are. Our country suffers from a neurosis that tells us that the only way to be beautiful is to develop an eating disorder. I’m sorry, but unless you have a very specific body type – and few people do – a size 2 on a woman who’s 5ft 6in looks sickly and underfed, not beautiful. And yet, a 5ft 6in model at size 2 is considered almost overweight. Rosemary’s journey is not the perfect road to self-confidence. The methods she chooses to lose weight range from good (starting an exercise routine) to bad (basically a fiction-world counterpart to Slim Fast) to horrible (self-induced food poisoning). Her reasons for losing weight are not always healthy either – doing it for others instead of herself. But all this stuff is realistic rather than idealistic, which is important to me. This stuff does happen in real life. Look at fad diets out there! Rosemary goes through a mental journey as well as a physical one and eventually learns to curtail bad thinking as well as bad dieting and bad eating. It’s a coming of age story both in mind and body, and I liked that. The book isn’t perfect. There are way too many vomiting scenes (again), and some of the characters seem almost like caricatures. Most of them grow into real people by the end of the book, though some don’t, like Rosemary’s Aunt Mary. There are also some unrealistic things that Rosemary goes through (like losing 13 lbs in 3 days after the self-induced food poisoning). 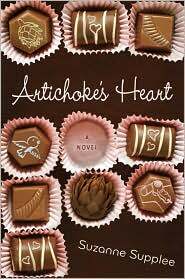 But for the most part, I really enjoyed Artichoke’s Heart. I really appreciate stories that go against what culture says about beauty and that try to teach women to value themselves instead of their looks. This entry was posted in 2010, Prose, Young Adult and tagged body image, food, gender studies, psychology. Bookmark the permalink.